Jealousy, hate, anger, revenge. These are all emotions that run rampant in these turbulent times. The reasons for these feelings are many, but above else, it is due to the constant wars and rivalries that continue to unfold from east to west and north to south. Scarcely is any part of the realm untouched and very rare is it indeed to find a Kingdom within that has found absolute peace. Most can see it for only a fleeting moment and then it is gone, darkness engulfing it once more. 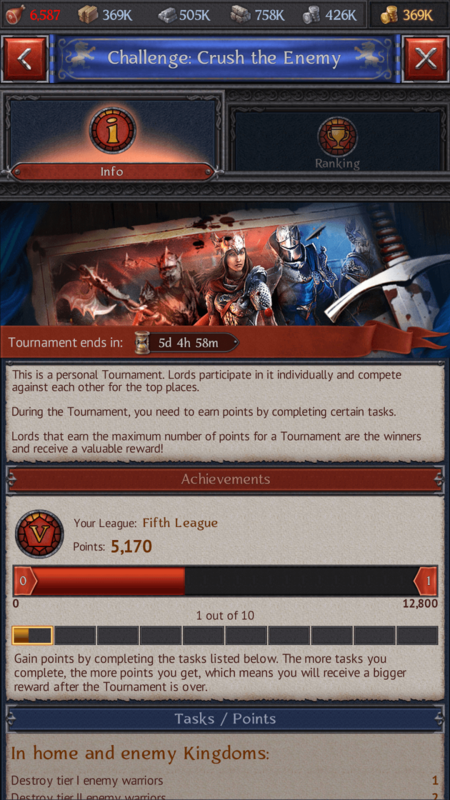 Not helping this situation are the Lords of the land, who continue to release event after event in which they pit man against man, tearing families and Kingdoms apart in the process. For many, this is ok, as the prospect of plunder, glory and conquest is what they live for. 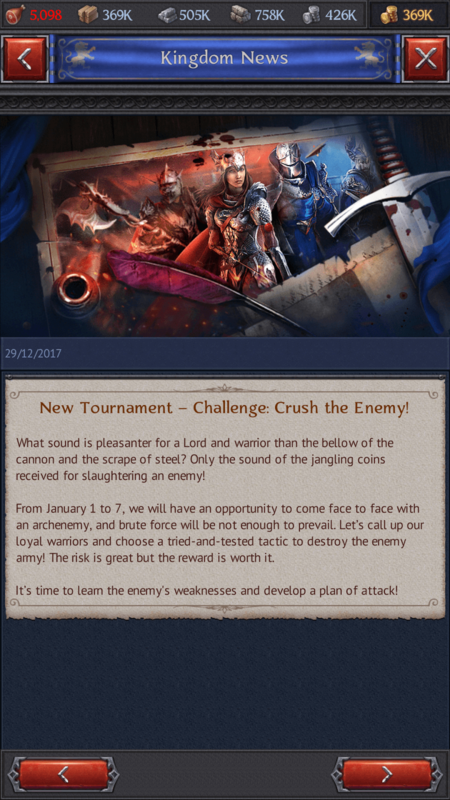 For these warriors, the recently announced new event, known simply as "Crush the Enemy!" was a welcome sight to behold. As shown above, this event was as straightforward and as brutal as it gets. The way to score points was not difficult to understand or learn: all that was required was to head out into the battlefield, find your enemies and destroy them. Simple to understand, but a more difficult feat to accomplish, for rare is the foe who will lay down and die easily. 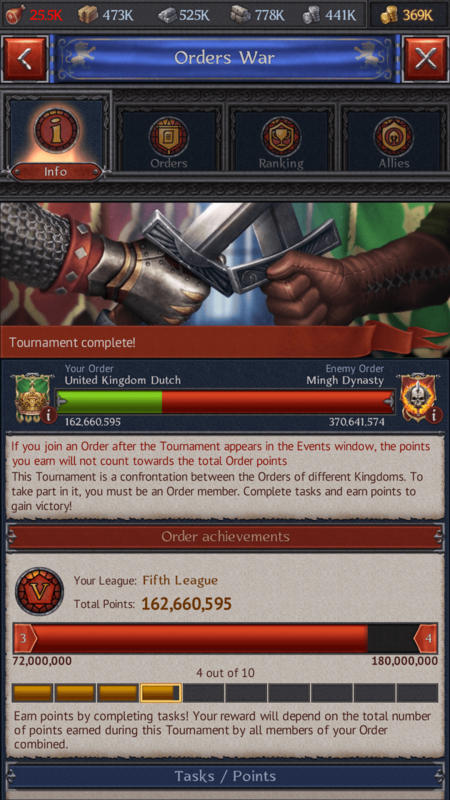 What made this event all the uglier, was the fact that it coincided with an Order War. 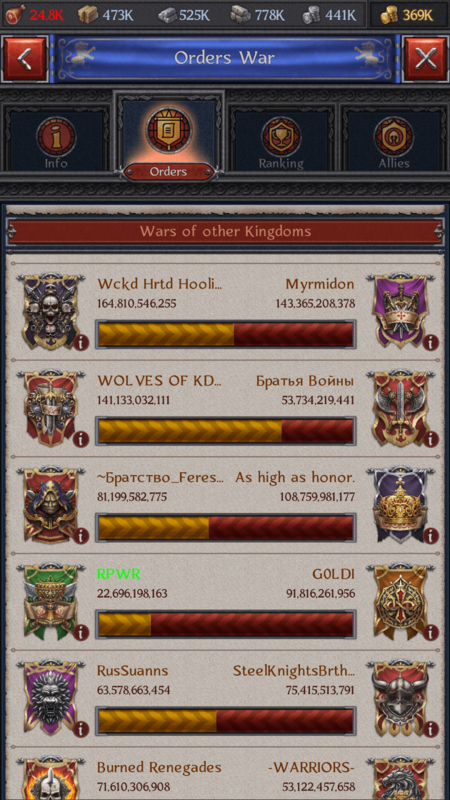 These Order Wars pit orders all across the realm against one another. 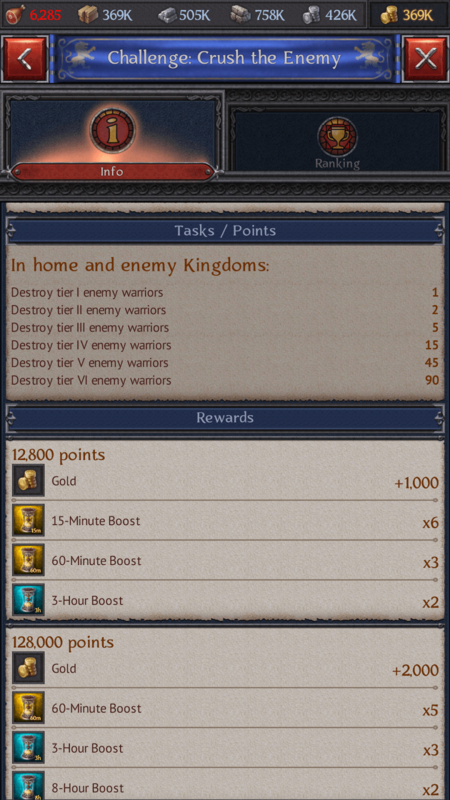 This double whammy of both an Orders War and a "Crush the Enemy!" event running alongside each other was too much for some to handle, as towns began to be plundered and burned all around them. The United Kingdom of Dutch was one Order that found themselves embroiled in a violent battle for survival. Their enemies, the Mingh Dynasty, were a brutal, seasoned fighting force that was out for blood. The Dutch fought back bravely, but as the days went on, it became more apparent that they were fighting a losing war. 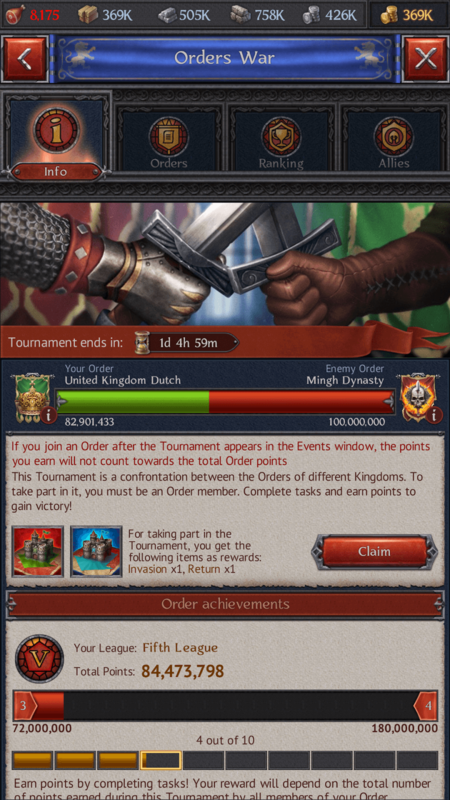 The Mingh Dynasty, having defeated their foe in single combat, were rewarded richly for both this Order vs. Order event and the "Crush the Enemy" event. This combination was repeated all across the realm, as Orders exerted their will over others, granting them great trophies in the process. Having just gone through this process themselves, many Orders are attempting to regain their footing and build back what they have lost. For the moment, there is calm, but for how long will this last? How long before the next batch of chaos and destruction is concocted?